If you create a new project in Visual Studio 2015, you'll see one new item in the frameworks list, and that's 4.5.3. Also named 4.6 Preview on some sources. It comes in two variations: Full CLR 4.5.3 and Core 5 (switch between in command line with KVM, or just right click to your project in VS, and open properties). Created on foundation of fallen Silverlight, since it had CLR runtime for running .NET cross platform (I heard this info on some podcast, forgot where and when. Please share some light in comments on this if you know, maybe I'm completely wrong!). Pragmatic and understandable approach, if I may add. Just remember, if you’re building something that has to be cross-platform, don’t depend on IApplicationBuilder, but just on OWIN delegate, and add registration to execution pipeline (appBuilder.UseXY()) as an extension method. 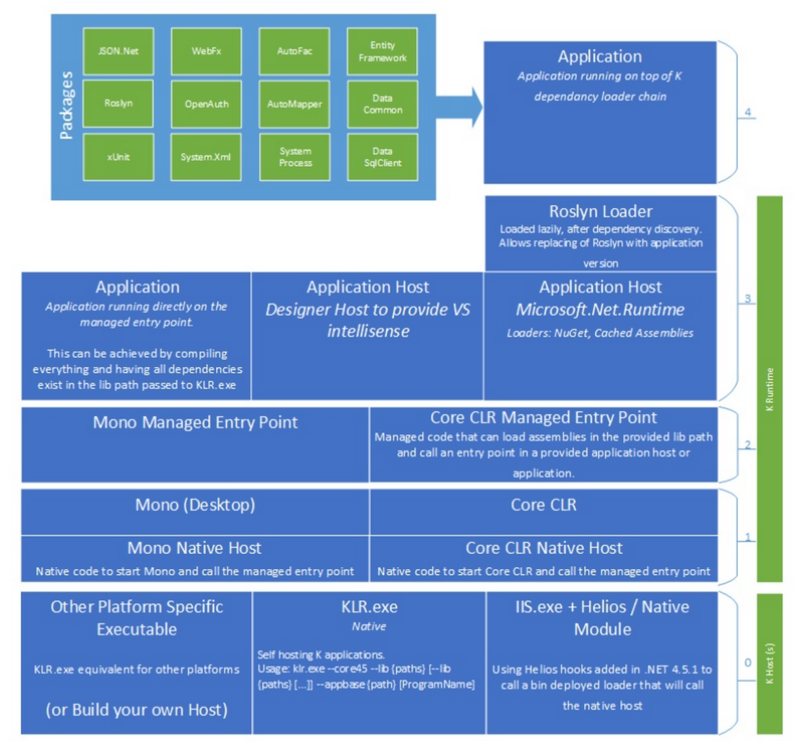 Currently, on .NET Core 5 (ASP.NET 5, or ASP.NET vNext or just vNext) you can run: MVC 6, WebAPI2, SignalR, WebPages, NancyFx, and the whole thing (Core 5, Kestrel, Helios, Configuration, projectless projects, DI, Roslyn on-the-fly compilation…) is named ASP.NET vNext. It's still under development, but even though surface API stabilized in last few months, it's not ready for production. MVC 6 project template includes Entity Framework 7, which is in alfa stage (Jan 2015) , and like Full .NET Vs Core .NET, it contains only subset of features from EF 6. Looks like a step back but it's really a complete rewrite of almost 10 years old ORM which was just too heavy and complicated to maintain and expand. Also, Core 5 doesn't run WebForms, and i think it never will (reminder: change this sentence if I was wrong). So long story short: .NET 5 is bin-deployable usb stick-portable subset of 4.5.3. It's cross platform and can run only new MVC 6. For everything else, use 4.5.3. Entity Framework 7 in first version will not support bunch of "advanced" features from v6, so think about it as Light EF MicroORM vNext v1. Looks like EF, smells like EF, but doesn't compute like EF. Works on 4.5.1+, where EF 6 doesn't work of Core 5. I would use it just if I have a good case for it, for example I want to run my app on the WinPhone. When it’s finished, it will work with NoSQL document storage (Azure Table Storage will be one of the first supported stores), Sqlite and PostgreSql (awesome db! ), other providers are expected after the release. Final release is expected after Core 5, so don’t really know what will be bundled in MVC 6 RTM template; EF6 doesn’t work on vNext, and E7 will not be RTM ready till then. Windows always automagically knew how to spin up CLR runtime when we double clicked on .NET created .EXE or requested an ASP.NET app through IIS. On Linux we have to write “mono …”. 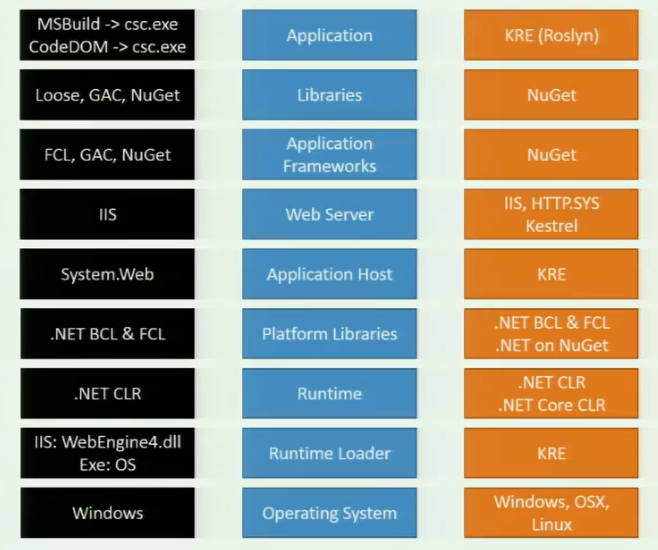 And now with cross-platform Core 5, we have KRE runtime loader (K Runtime Environment) to do that. It's also used as an application host instead of good ol' rusty System.Web, and for running Roslyn to compile on-demand or on-the-fly. K Package Manager. Like Nuget, just works (finally) without Visual Studio (Nuget prior to v3 relied heavily on Visual Studio for adding references to a project and bunch of other stuff, for example). When OWIN was drafted and reached v1, Microsoft needed an "adapter" to run OWIN-based apps on top of ASP.NET 4.5, meaning System.Web. And that's Katana, created as temporary solution until we get final Core 5. Contains hosts, servers and middlewares so we can run OWIN apps on IIS, self-hosted with HttpListener. For every request IIS calls into System.Web, which heavy architecture optimized for big statefull web apps (that's how they envisioned web should work in 2000.) is just not optimized for many small request and todays usage scenario (REST, microservices, etc). OWIN is free of System.Web, so new server for hosting ASP.NET on IIS could be built, and that's Helios. It uses around 3kb per request, compared to 30kb of System.Web, enables a lot more concurrent connections per server. Think of Node.JS performance, or even better. Like there's a Helios for IIS, to server request on Linux there's Kestrel (works on Windows also). Built on top of libuv, cross-platforms asychronous I/O, battle tested offers and with great performance. Libuv uses single threaded event loop to receive incoming request, which are then handled over to .NET thread pool. It’s important to use it properly and not just expose Kestrel HTTP endpoint to public, but rather keep it behind some "real" HTTP server, like Nginx.